Writing. Why do we do it? To capture ideas from a particular moment in time – perhaps. To express ourselves – maybe. To connect with others – possibly. The answer is ultimately different for everyone. It may not be a million dollar question, but it is at the heart of where a blog begins. Over the last year, I’ve read several articles on why teachers should blog, such as Why I Blog (and How You Can Too), Why You Should Start a Blog (and How to Do It), Blogging the Unbloggable… #thefirstyear, and two of my close friends have embarked on their own blogging journeys at Chronicles of a Modern Explorer and Lacquer, Teach, Repeat. Yet, it is because of my students that I find myself typing at this keyboard. At the start of the year, I introduced the phrase “Be More Dog” to my class. It was to be our mantra, the slogan that would inspire and help students through the darkest of moments. Very similar to last year’s class saying “Embrace the Struggle”, which I was told later became a favorite hashtag via Instagram when students were working on homework, essays, and projects. I started this year’s lesson off by showing the following video. After watching the video, our class discussed what it meant to “Be More Dog”. Our conversation centered around how to push past obstacles, procrastination and laziness, and how to be the best version of ourselves. The wall at the back of the classroom is dedicated to student work that demonstrates students “Being More Dog”. Here is my last class of the day smiling after a vocabulary review activity. 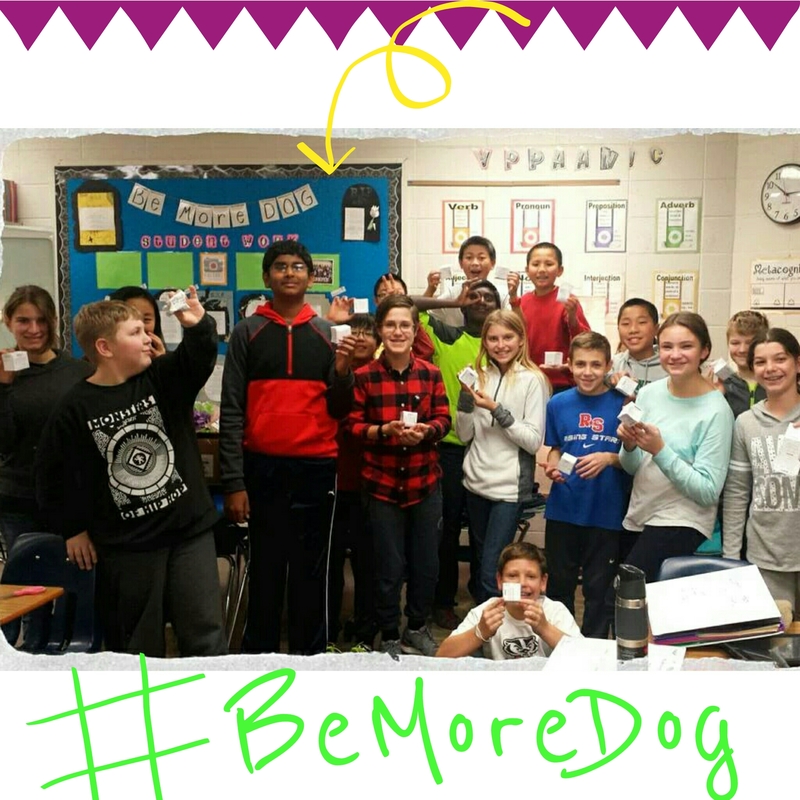 Throughout the year, the phrase “Be More Dog” is a quick phrase I can say to any student as a reminder to stay focused, keep up the effort, to think outside the box, to be a stronger, confident, more ambitious version of themselves. As teachers, we have to model the behaviors we expect of our students. How can we ask our students to become life-long learners if we don’t embody those behaviors ourselves? How can educator’s preach setting goals and working hard if we are not willing to engage in those experiences for ourselves? Students need to learn from the adults in their lives what these behaviors look, sound, and feel like. Modeling these expectations and behaviors will help students develop a more rounded understanding as they develop these skills for themselves. All of this brings me to this blog. Thank you to my students for reminding me to step outside of my comfort zone, try something I’ve never done before and be the best teacher I can be. This is me. My classroom. My adventures. This is me – being more dog! Love it!! I use the “be more dog” video all the time! One thing I’ve learned through blogging is to forgive myself. Life happens, new jobs happen, and your blog will always be there and there will always be people learning from it and loving it (even if you neglect it for months at a time AND THAT’S OKAY, because it’s all yours). I can’t wait to follow your journey! Thank you for the advice! I’m excited to see how it grows and changes over time. I really appreciate all of your support and guidance over the last few years. Congratulations! I remember starting mine at geniushour.blogspot.com – what a scary, yet fun reflective endeavor. This is a great post to begin with, and it looks great, as well! I’ll be following your blog using Feedly, under my “MS ELA teachers” category. And I’m definitely going to use the video with my 7th graders, as well – we haven’t seen it as a class yet this school year. Why didn’t I use it at the beginning of the year?! Enjoy using your blog for whatever purposes you deem right for you. It will evolve over time and you’ll be able to look back fondly. Here’s to 2016 and being more dog! Thanks Joy! I’m really glad we have connected via twitter and I’m fortunate to have your support as I try this new endeavor.